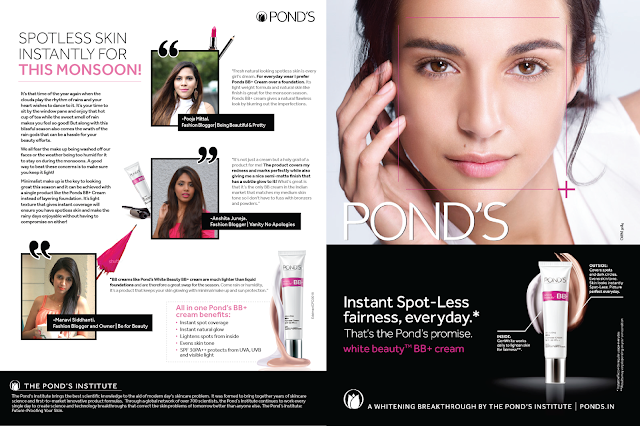 So happy to share with you guys that I was recently featured in the HT Brunch Magazine for Ponds BB+ . I got the opportunity to share few tips on how to get perfect spotless skin for Monsoon. Fresh natural looking spotless skin is every girls dream. If the base of makeup is right, everything comes together very well. For everyday wear I prefer Ponds BB+ Cream over a foundation. Its right weight formula and natural skin like finish is great for Delhi heat and even the coming monsoon season. Ponds BB+ cream gives a natural flawless look by blurring out the imperfections and without digging a hole in pocket. It keeps skin looking fresh and oil free the entire day. After applying a thin layer of Ponds BB+ cream every morning, I like to add a little bit of bright pink blush, a thin line of water proof, nice perky lashes and then top everything with matte pink lips for a fresh everyday makeup look. Full review on the cream and the look details for the feature coming up soon on the blog.